What is Target ROAS Bidding? How Does Target ROAS Bidding Work? This guide is a detailed look at Target ROAS bidding, if you are unfamiliar with this bidding technique or bidding strategies in general; you may want to read our introduction to bidding strategies first. 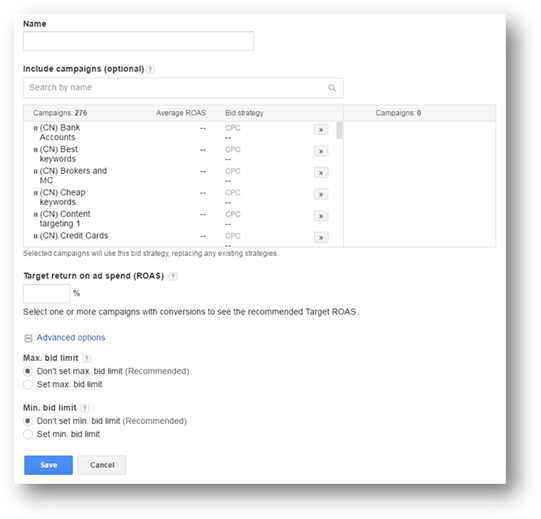 Target ROAS is an automated bid strategy that allows you to target a specified ‘Return on Ad Spend’ (ROAS). Before we explore CPC Bidding in more detail it is first worth explaining a little bit about how auctions work and what they are. The auction is the process that occurs with each search performed in Google (the display network works slightly differently to this). Automated bidding strategies allow Google to control your bidding through algorithms and automated computing systems in order to achieve a target. All automated bid strategies are goal orientated bidding systems, meaning that they are designed to help the advertiser achieve their goals. There are typically two flavours for most automated bidding strategies, but for Target Return on Ad Spend Bidding strategy, you have to create a portfolio bid strategy or use an existing one… There is no ‘standard’ version of this bid strategy available. Portfolio bid strategies can be applied to multiple campaigns and they work across all of these campaigns to achieve targets. In the case of ‘Target ROAS’, this will apply a target spend across all of the campaigns to which it is applied… meaning that some campaigns may under Target and some may be over target, but in total the target should be met (when aggregating across all of the campaigns). Return on ad spend is calculated by dividing the (ad) revenue by the (ad) cost. Typically, this is represented as a percentage where anything above 100% is a profit and anything under is a loss, with 100% being break even. Hence a Target ROAS bidding strategy will aim to hit a specific (and user specified) value. ROAS and ROI (Return on Investment) are very common targets for businesses and hence this strategy is more commonly used than some of the others available within the flexible bid strategy suite. Whether advertisers are targeting ROAS manually or with a bid strategy such as this, ROAS targets are very common. To some extent many of the pros and cons of this automated bid strategy are the same as using any automated bid strategy, such as less control vs less work… however, we have limited the pros and cons here to those relating to this specific bidding method. As with many automated bidding strategies, the more data that there is available for AdWords to work with, the better the results will be. Setting a ROAS target well above or below what you are currently achieving can also be a problem for the tool… Typically you can make incremental changes no more than 20% different from the current target. ROAS Bidding can work across many campaigns, ad groups, keywords, etc… Consequently, some will be over and some will be under target ROAS; the aim is that overall (as an average across all components) the ROAS will be on target. As the image above shows, there are a number of parameters to explain within this bidding strategy each of which are described below in more detail. This where you have to set the target ROAS. Here you can specify a maximum cost per click for the strategy that will be applied to all keywords that the strategy is applied to. This prevents the strategy from running wild with CPC’s. This is not an ‘absolute’ value, AdWords could bid lower than this value under certain conditions. It is typically worth setting a value for this to prevent low quality traffic. Traffic that comes in at a few cents per click is often lower quality.